The average four wheel drive is the car equivalent of a cowboy. Tough. Rugged. Uncompromising. With the Allroad, Audi has produced a car that resembles the male lead from a romance novel: not only is it tough and capable, it is also classy and sophisticated with a soft and generous inside. The first question anyone asks of a four wheel drive vehicle like the Audi Allroad is: “Can it go off road?” The Audi Allroad, while it may not have the ground clearance of a military-style vehicle like a Jeep, certainly has enough ground clearance to get over a bumpy paddock – back country roads are a breeze for the German-built Audi Allroad. 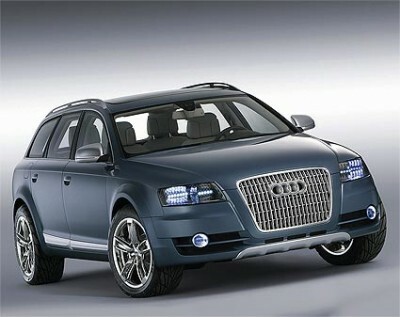 And the Allroad has Audi’s famous Quattro system of four wheel drive. So even though it is not a serious bush-basher, the Audi Allroad is capable of taking you for a day’s fishing or skiing, or exploring obscure roads in the middle of nowhere – the capacious boot space will easily fit in all your equipment and the double bar aluminium roof rails are perfect for toting skis (a ski bag is available as an option). Back from nowhere and on the open highway, the Audi Allroad can unleash some very respectable power that would leave other cars envious. The 3.0 litre diesel engine is capable of producing 171 kW of power at 4000 rpm and a huge 450 Nm of torque at a very low 1400-3250 rpm. The powerhouse inside the Audi Allroad is capable of pushing a lot of car to 100 km/hr from a standstill in 7.8 seconds, and has a top speed of 230 km/hr. The six-speed tiptronic transmission with DSP and sports program takes driving the Audi Allroad well beyond the usual experience of driving a four wheel drive vehicle. The adaptive air suspension plays its part in making the ride of the Audi Allroad more comfortable and the servotronic speed sensitive steering make this a very responsive and sensitive vehicle. When you are riding inside the Audi Allroad, you are in very safe hands. The Allroad has Audi’s back guard system in place, which protects passengers in a rear end collision by holding the upper body in place and supporting the head. The brakes are as sophisticated and up-to-date as anyone could wish for. The ESP (electronic stabilisation program) comes with an off-road mode, electronic differential lock, electronic brake force distribution and ABS with brake assist. The Audi Allroad has plenty of airbags to protect everybody on board: two-stage front airbags for driver and front passenger, side airbags for the front and back seats, and sideguard head curtain airbags also in both front and back. Inside, the Audi Allroad has all the conveniences that you would expect to find in an upmarket European car. Leather upholstery with aluminium inlays makes the interior of the Audi Allroad tasteful and pleasant to look at (and the optional wood-look inlays are even better). The voluptuously padded seats come with lumbar support in the front, as well as an armrest – almost as good as a lounge chair, if not better. Cruise control, deluxe automatic air conditioning and a 10-speaker CD/radio system all make riding in the Audi Allroad a pleasure (as if driving it wasn’t pleasure enough). And if you chose the optional heated seats?Mmm – very nice indeed. The Audi Allroad is a very capable blend of practicality, toughness, power and comfort. Almost exactly like a Mills & Boon hero, in short. For any more information on the Audi Allroad, or for that matter any other new car, contact one of our friendly consultants on 1300 303 181. If you’d like some fleet discount pricing (yes even for private buyers! ), we can submit vehicle quote requests out to our national network of Audi dealers and come back with pricing within 24 hours. Private Fleet – car buying made easy!